^ Benjamin, Don C. (2009-03). Stones and stories: an introduction to archaeology and the Bible. Fortress Press. p. 33. ISBN 9780800623579. http://books.google.com/books?id=OBcG8phWFMYC&pg=PA33 2011年7月14日閲覧。. ^ a b c d 小野 2007, p. 170. ^ a b c d Oxford English dictionary (1989) s.v. "Rosetta stone"
Adkins, Lesley; Adkins, R. A. (2000). The keys of Egypt: the obsession to decipher Egyptian hieroglyphs. HarperCollins. ISBN 9780060194390. Allen, Don Cameron (1960). “The predecessors of Champollion”. Proceedings of the American Philosophical Society 144 (5): 527–547. Andrews, Carol (1985). The British Museum book of the Rosetta stone. British Museum Press. ISBN 9780872260344. Assmann, Jan; Jenkins, Andrew (2003). The Mind of Egypt: History and Meaning in the Time of the Pharaohs. Harvard University Press. ISBN 9780674012110. http://books.google.ca/books?id=XEMadfTi_U4C&lpg=PA376&dq=Horwennefer&pg=PP1#v=onepage&q=Horwennefer&f=false 2010年7月21日閲覧。. Bagnall, R. S.; Derow, P. (2004). The Hellenistic period: historical sources in translation. Blackwell. ISBN 1-4051-0133-4. http://www.columbia.edu/itc/classics/bagnall/3995/readings/b-d2-9.htm 2010年7月18日閲覧。. Bevan, E. R. (1927). The House of Ptolemy. Methuen. http://penelope.uchicago.edu/Thayer/E/Gazetteer/Places/Africa/Egypt/_Texts/BEVHOP/home.html 2010年7月18日閲覧。. Brown, V. M.; Harrell, J. A. (1998). “Aswan granite and granodiorite”. Göttinger Miszellen 164: 133–137. Budge, E. A. Wallis (1894). The mummy: chapters on Egyptian funereal archaeology. Cambridge University Press. http://www.archive.org/details/cu31924086199548 2010年7月19日閲覧。. Budge, E. A. Wallis (1904). The decrees of Memphis and Canopus. Kegan Paul. ISBN 9780766148093. http://books.google.fr/books?id=oDrjJjQbpi0C 2010年7月18日閲覧。. Budge, E. A. Wallis (1913). The Rosetta Stone. British Museum. http://www.archive.org/details/rosettastone00budguoft 2010年6月12日閲覧。. Burleigh, Nina (2007). 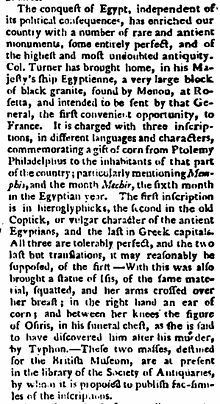 Mirage: Napoleon's scientists and the unveiling of Egypt. HarperCollins. ISBN 9780060597672. Dewachter, M. (1990) (フランス語). 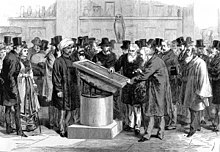 Champollion : un scribe pour l'Égypte. Gallimard. ISBN 9782070531035. Downs, Jonathan (2008). Discovery at Rosetta: the ancient stone that unlocked the mysteries of Ancient Egypt. Skyhorse Publishing. ISBN 9781602392717. El Daly, Okasha (2005). Egyptology: the missing millennium: Ancient Egypt in medieval Arabic writings. UCL Press. ISBN 1844720632. http://books.google.fr/books?id=f2Viq2w08AMC 2010年7月20日閲覧。. Kitchen, Kenneth A. (1970). 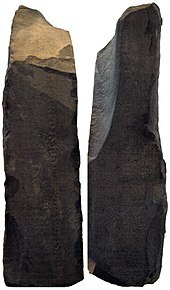 “Two donation stelae in the Brooklyn Museum”. Journal of the American Research Center in Egypt 8. Meyerson, Daniel (2004). 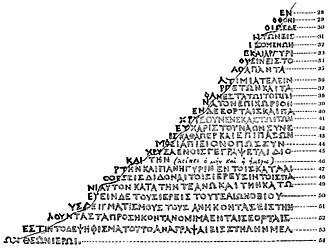 The linguist and the emperor: Napoleon and Champollion's quest to decipher the Rosetta Stone. Ballantine Books. ISBN 9780345450678. Middleton, A.; Klemm, D. (2003). “The geology of the Rosetta Stone”. Journal of Egyptian Archaeology 89: 207–216. Oxford English dictionary. 2nd ed.. Oxford University Press. (1989). ISBN 978-0-19-861186-8. http://dictionary.oed.com/. Parkinson, Richard B.; Diffie, W.; Simpson, R. S. (1999). Cracking codes: the Rosetta stone and decipherment. University of California Press. ISBN 9780520223066. http://books.google.com/books?id=QD9g1mMaAAsC 2010年6月12日閲覧。. Parkinson, Richard B. (2005). 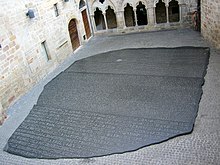 The Rosetta Stone. British Museum objects in focus. British Museum Press. ISBN 9780714150215. Quirke, Stephen; Andrews, Carol (1989). 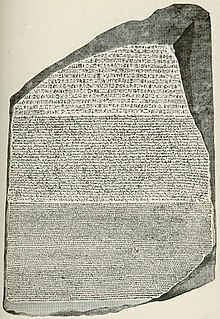 The Rosetta Stone. Abrams. ISBN 9780810915725. Ray, J. D. (2007). The Rosetta Stone and the rebirth of Ancient Egypt. Harvard University Press. ISBN 9780674024939. http://books.google.com/books?id=TJCT5ajby2IC 2010年6月12日閲覧。. Robinson, Andrew (2009). Lost languages: the enigma of the world's undeciphered scripts. Thames & Hudson. ISBN 9780500514535. Simpson, R. S. (1996). 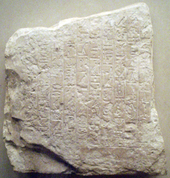 Demotic grammar in the Ptolemaic sacerdotal decrees. Griffith Institute. ISBN 9780900416651. Solé, Robert; Valbelle, Dominique (2002). The Rosetta Stone: the story of the decoding of hieroglyphics. Four Walls Eight Windows. ISBN 9781568582269. Spencer, Neal; Thorne, C. (2003). Book of Egyptian hieroglyphs. British Museum Press, Barnes & Noble. ISBN 9780760741993. Synopsis of the Contents of the British Museum. British Museum. (1847). http://books.google.com/?id=jHJUAAAAYAAJ&printsec=frontcover#v=onepage&q&f=false. Walker, Susan; Higgs, Peter (editors) (2001). Cleopatra of Egypt. British Museum Press. ISBN 0-7141-1943-1. Wilson, Robert Thomas (1803). History of the British expedition to Egypt. 4th ed.. Military Library. http://books.google.fr/books?id=mypLAAAAYAAJ 2010年7月19日閲覧。.